The intrepid VolcanoBot 1 explores a lava tube inside Hawaii's Kilauea volcano in May 2014. NASA will test the new VolcanoBot 2 in Kilauea in March 2015. NASA is gearing up to test an innovative new robot built to explore some of Earth's most inhospitable places: the fiery heart of volcanoes. Engineers at NASA's Jet Propulsion Laboratory in Pasadena, California, are gearing up to drop VolcanoBot 2 inside Hawaii's active Kilauea volcano in March to create a 3D map of its fissures and crevices. And the hardy robot may one day help scientists explore volcanoes on other worlds. 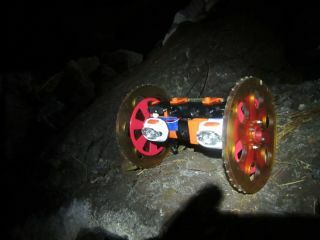 VolcanoBot 2, and its predecessor VolcanoBot 1, are designed to fit inside crevices in volcanoes that are too small or too dangerous for humans to explore. The robots are the brainchild of Carolyn Parcheta, a volcanist and NASA postdoctoral fellow based at JPL. Carolyn Parcheta, a postdoctoral fellow at NASA's Jet Propulsion Laboratory in Pasadena, California, poses with the robot VolcanoBot 2, which will explore the inside of Hawaii's Kilauea volcano in March 2015. "We've never had a chance to measure a volcanic conduit before because they usually get buried or destroyed during an eruption," Parcheta said in her project's entry in a National Geographic Expedition contest. But Parcheta found two preserved, inactive fissures in the active Kilauea volcano in Hawaii. She and her JPL co-advisers, Aaron Parness and Karl Mitchell, already tested VolcanoBot 1. In May, NASA sent VolcanoBot 1 down 82 feet (25 meters) to two locations on the fissure. The wheeled robot is about 12 inches (30 centimeters) long with wheels that are 6.7 inches wide (17 cm). "In order to eventually understand how to predict eruptions and conduct hazard assessments, we need to understand how the magma is coming out of the ground," Parcheta said in a NASA statement. "This is the first time we have been able to measure it directly, from the inside, to centimeter-scale accuracy." The scientists found, however, that VolcanoBot 1 was too large and it's motors too weak to reach the fissure's bottom. Therefore, VolcanoBot 2 was born. With its length of 10 inches (25 cm), VolcanoBot 2 is smaller and lighter than its predecessor, with features that allow it to look up, down and around a fissure. VolcanoBot 2 (left) and its larger predecessor, VolcanoBot 1, are robots built to explore nooks, crannies and fissures inside a volcano and create 3D maps of the terrain. In March, NASA will drop VolcanoBot 2 inside the maw of Hawaii's active Kilauea volcano. Data will be collected and stored onboard VolcanoBot 2, and the robot's 3D live- video feed will allow Parcheta and her colleagues to navigate its path more accurately. Parcheta hopes the project will help scientists build more complex models of how volcanoes erupt. And the tiny robots won't only add to our knowledge of Earth's volcanoes. NASA hopes technology like the VolcanoBots can someday be used to explore how volcanoes once erupted on Mars and other solar system locales. "In the last few years, NASA spacecraft have sent back incredible pictures of caves, fissures and what look like volcanic vents on Mars and the moon," Parness said. "We don't have the technology yet to explore them, but they are so tantalizing."